I have admired the arts of Africa since college where I was preparing to be an art historian in the mid 1970’s. When I decided to leave graduate school and pursue a career in sculpture, it was primarily for the reason that I connected viscerally with the art forms rather than intellectually with their study. I had the good fortune to meet the Chicago sculptor, Richard Hunt, and see his extensive collection of African works at his studio. I thought to myself for weeks after, someday I would love to own a sculpture like those in Mr. Hunt’s studio. Twenty years later I began to create works inspired by the Bambara and Senufu wooden sculptures primarily for myself, and later, for an audience. The wooden Chiwara, of the Bambara ethnic group of Mali, represent the antelope form. They are used in initiation rituals and dances to teach young Bamana men social value. When carving the works, bent or straight horns represent either the male or female. The forms themselves are breathtaking and dynamic. * They appear as reserved and powerful, much like early Egyptian stone carvings, but with warmth resonating through their organic nature. 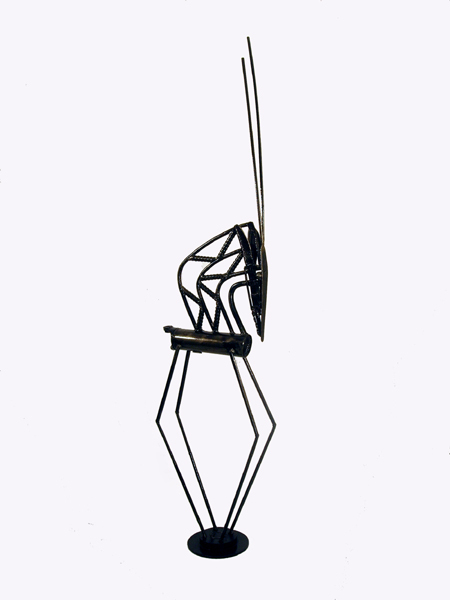 In the Bambara pieces, SAUVAGE I.1 and I.3, the basic antelope form is used as the reference. Drawing from my Detroit origins and using recycled tool and automobile parts as my pallet, I cut, mold and weld my figures. Finally, the surface is finished in oil to solidify all the different elements together. The Senufu people of the Ivory Coast create large beautiful sculptures of Hornbill birds, believed to be their mythical ancestors. Worn as small headdresses or as meter high, stand alone works; they are used as symbols of fertility. Carved generally with large flat protective wings, the Porpianong birds have beaks that touch their pregnant stomachs, symbolic of the male and female duality and insuring tribal continuity. 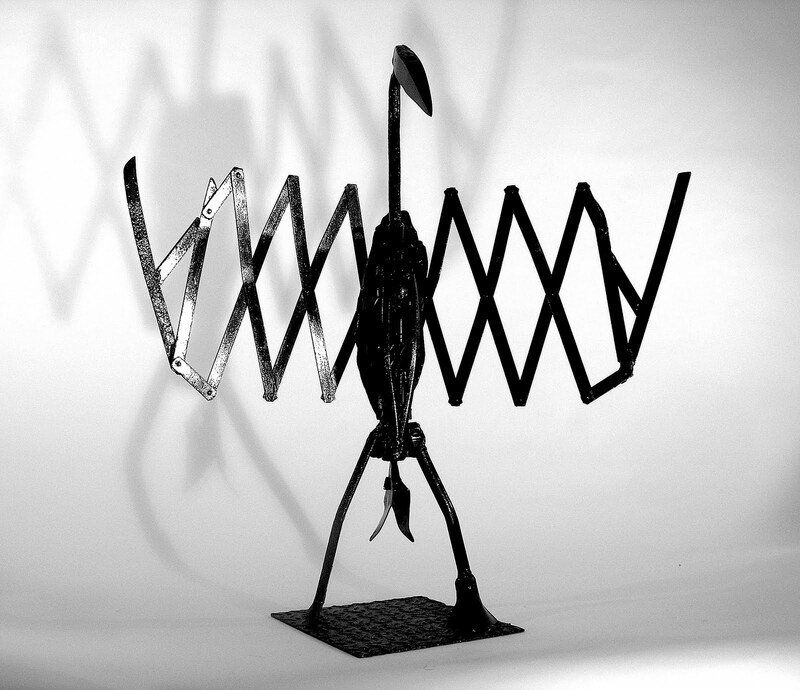 The Senufu inspired sculptures SAUVAGE B.1, B.3 and B.6, resonate with the African origins. The latest piece, SAUVAGE B.6, closely resembles traditional Porpiangong style except for the house figures on the wings. SAUVAGE B.1 and SAUVAGE B.3 stand somewhat more abstracted. The same construction techniques were used as with the Bambara pieces.